Defence Minister Jonathan Coleman says Navy frigate HMNZS Te Mana has departed Darwin today for counter-piracy operations in the Gulf of Aden. “New Zealand remains committed to contributing to international anti-piracy efforts,” says Dr Coleman. “A secure maritime environment is vital to economic prosperity and regional security. It is important nations work together to address the global challenges to maritime security. The Combined Maritime Forces (CMF) is a multinational naval partnership of 29 nations. It operates over 2.5 million square miles of international waters, and encompasses some of the world’s most important shipping routes. HMNZS Te Mana has completed nearly three months of specialist training in Australia in preparation for her deployment. HMNZS Te Mana will operate as part of Combined Task Force 151 (CTF-151) for three months, returning to New Zealand in March 2014. The NZDF has deployed four staff officers to support CTF-151 headquarters in Bahrain. Three NZ Navy sailors are also currently deployed on HMAS Melbourne, conducting maritime security patrols in the region. Next year, the NZDF will deploy up to 14 staff officers to CTF-151, two additional personnel to Headquarters CMF, and a P3-K2 Orion will also deploy. New Zealand has previously supported the Combined Maritime Forces. 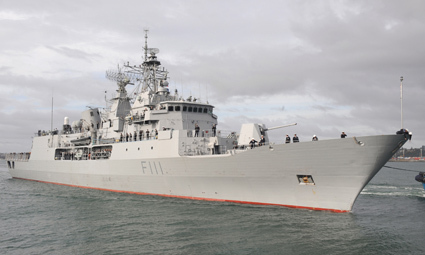 A NZ Navy frigate deployed in 2008 to support counter-terrorism operations, and a number of staff officers have deployed, most notably in 2011 when a NZ Navy Captain commanded CTF-151.